The “Bouledogue Francais,” or French Bulldog, likely descended from the English bulldog. Judging by his smaller size and bat-like ears, most think that the French Bulldog actually arose from the toy or miniature Bulldog, which originated in Nottinham, England, where he was used as a ratter in the shops of laceworkers. During the industrial revolution, lace workers displaced by the rise of machines moved about Europe looking for work, and in the shuffle, their little Bulldogs ended up in France, where they were immediately popular. In fact, the French Bulldog was a fashionable companion in bohemian society, favored by society ladies, prostitutes, artists and writers throughout France. Today the French Bulldog, big ears and all, is one of the most popular dogs in the U.S.
With his bat shaped ears and bow-legs, this little guy resembles an alien. But he’s no stranger to affection! The French Bulldog is charming and pretty easygoing. He’s quietly enthusiastic, often preferring to sit and watch what’s going on around him. He also loves to goof around. He generally gets along well with other dogs – though at times he wants to be the alpha dog, this can be addressed through training. One of the best things about the French Bulldog: he’s the ideal dog for city-dwellers. As a mellow, smaller dog that doesn’t need a ton of exercise, he does very well in the confines of an apartment. He won’t bark or get too worked up, unless you aren’t able to spend enough time with him. Respiratory problems, such as brachycephalic airway syndrome, which causes difficulty breathing. This can cause a lot of wheezing and snoring, and makes it hard for them to cool off in hot weather. Stay out of the heat! The French Bulldog is very, very sensitive to the heat. This is mostly due to his difficulty breathing, which makes it difficult for him to cool off. It is important to make sure the French Bulldog is cool and always has access to fresh water. The French Bulldog also doesn’t swim very well. The French Bulldog can be a bit difficult to housetrain, so you’ll have to be patient. French Bulldogs are only moderately active. They also tend to have breathing problems. That means that they are not ideal for a really active person or family. The French Bulldog can be touchy around small children or cats and is sometimes aggressive toward strange dogs. 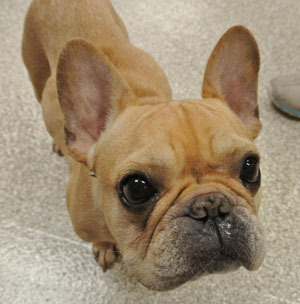 When trained well and exercised thoroughly, the French Bulldog can be a great companion for the right person or family.